Weightloss was the last thing on my mind, however, getting back to gym was a priority as I knew it would help to lift my spirits. I felt ready to get back in the gym by two weeks postpartum, but my doctor said I had to wait at least till 4 weeks. A week after birth, I had already lost 8 kilos - this was obviously - the baby, blood volume, placenta and excess water retention that I had now lost. I have been wanting to share this particular story with you for a while now, but I wanted to gather my thoughts properly. In order to tell it properly, I need to start from my pregnancy journey. During my pregnancy, I was an active mom-to-be. Making sure I was training at least three-four times a week, at virtually the same intensity I trained at during my pregnancy. However, my eating habits and cravings were so different to my usual way of eating. I was a high protein, low carb, loads of fresh veggies, greens and fruit kinda gal. But during my pregnancy, things changed drastically. I often use the phrase ‘my body betrayed me’ in that everything that I would usually have eaten it completely rejected. I could not stand the smell or idea of even eating chicken, anything green made me queezy. To clarify, I never suffered from any morning sickness. The closest I got to experiencing it, was when I tried to add spinach to my protein shake and I tried to drink it, the minute I got a wiff of those greens, my stomach turned and I came close to vomiting. So I decided there and then, to not force anything into myself that didn’t feel right at the time. So, what did I crave? – Lots and lots of carbs, all my body wanted was pasta, bread, rice, potatoes – you name it! I craved traditional Cape Malay stews (which is basically loads of rice and potatoes). I ate lots of pasta and Burger King! It was so funny, the first time I even ate Burger King was during my pregnancy, when I went there for the first time, my husband asked the cashier so many questions about the menu and she looked at us like, “Have you people been on Mars?! How do you not know our menu? !” But real talk, we had never been there before I fell pregnant. The big reason we ended up eating lots of takeout was I started getting so tired in my third trimester, what with work, life in general, I had no energy to cook at night. Another food craving that also didn’t do me any favours was an odd craving for peanut butter on toast with banana. Before I fell pregnant, I hated even the smell of peanut butter, you couldn’t pay me to eat it! During my pregnancy – I had it everyday for lunch and afternoon tea. On the day I went into labour – I went for lunch with my dad – we had pizza! lol! Just before I gave birth I weighed myself and I had gained a total of 24kgs. I had the most amazing birth experience, I gave birth naturally (with epidural) and thankfully, Esa was just perfect, no complications at all. The first month was hard for me because I struggled to latch my baby and then got Mastitus – I would not wish this on my worst enemy! It is awful. Due to all this, I developed postpartum depression. Weightloss was the last thing on my mind, however, getting back to gym was a priority as I knew it would help to lift my spirits. I felt ready to get back in the gym by two weeks postpartum, but my doctor said I had to wait at least till 4 weeks. 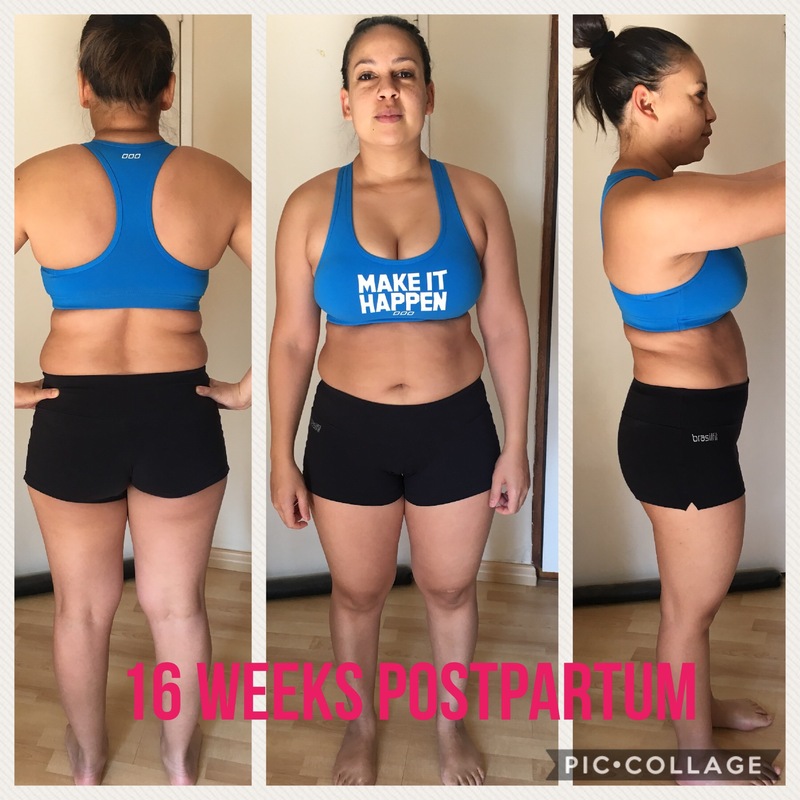 A week after birth, I had already lost 8 kilos – this was obviously – the baby, blood volume, placenta and excess water retention that I had now lost. I clearly had a long way to go, as you can see by the look on my face in these pics. The day the doctor cleared me to start training I was in the gym that very same day. I was still breastfeeding (when I could and pumping), I also didn’t have a nanny yet, so I had to fit in gym at night when my husband got home, after supper and after we had put baby down for the night. It was such a chore to get to the gym after 7pm at night. 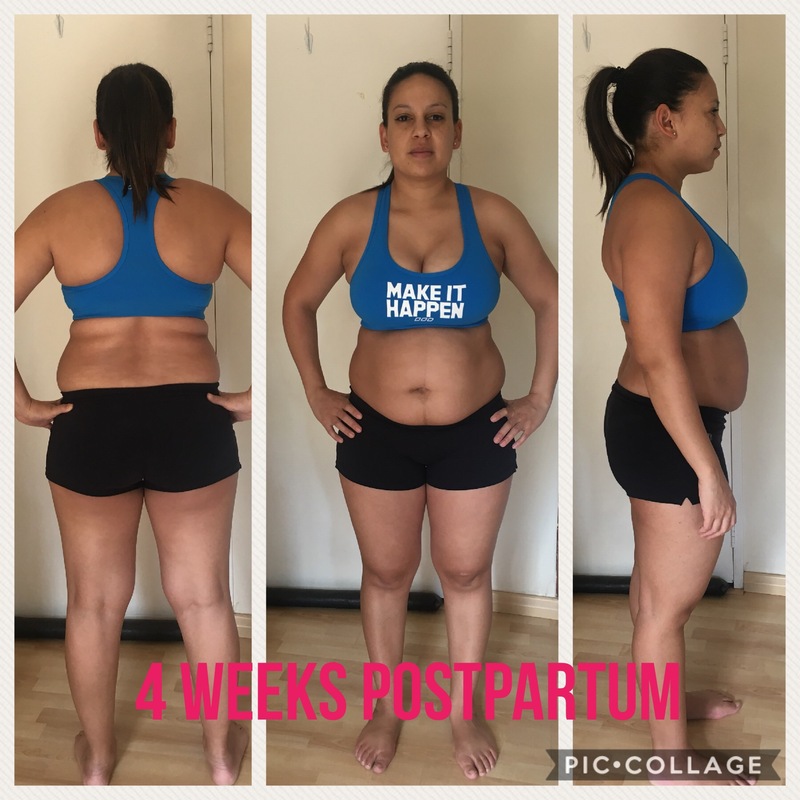 In the months that followed I saw slow progress in my weightloss, I was so confused because I had gone back to the way I ate before pregnancy – I got rather frustrated. I even sort out the help of my friend and registered dietition Nathalie Mat to draw up an eating plan for me to clean up my eating even more. It was a delicate balance because we couldn’t cut my calories so drastically so that my milk supply dropped, so we had to keep it pretty safe and balanced. It was Nathalie that drew my attention to the fact that the anti-depressants/milk supply enhancers – Erglenol, can cause slow or even completely block weight loss. I quickly weaned myself off those (you have to wean yourself off them, else you can bounce back into depression). By this point I was still taking the Erglenol but only every other day, I just started work too and still trying to gym as often as possible (3-4 times a week, sometimes I only managed twice a week) and eating healthily. I decided to stop watching the scale and go on how my clothes fit me. This was mainly because getting obsessed with the numbers wasn’t doing me any favours, so I decided to break the cycle. I was so thrilled that I had made some progress! I could visibly see the change happening, this was hugely encouraging! In the remaining months (5-9 months) that followed I developed a very serious wrist injury in both my wrists due to holding my baby incorrectly while breastfeeding. This hampered how I could train, so I needed to go for physiotherapy to treat it, this was a slow tedious process. I also stopped breastfeeding completely just before Esa was 6 months old. However, going off those anti-depressants helped a huge amount as the weight really started to come off, I even had the courage to weigh myself again and I saw a 500g-1kg weekly drop (which is the recommended rate at which to lose weight to maintain long term results). More fasted cardio – I started going to my HIIT group classes first thing in the morning on an empty stomach, having just had a double espresso as a pre-workout. Don’t mix fats and carbs – Just a little nugget of advice that I got from a fitness guru I know, who believed that one should never mix your fats and carbs, always have one or the other accompanying your protein on your plate. eg, if you are having a chicken breast, either have avo (fat) with it in your salad, or no avo but sweet potato (carb). I started counting calories – I remembered I used to use an app called ‘My fitness pal’ to track the calories in all the food I ate for the day and I would know exactly what I was taking in. I could then tweak as the day went along to stay within my recommended calories for the day. Meal prep: I used to make bulk portions of chicken breasts or fish fillets and made sure I had salad and or veggies in my fridge so I could make that to go with my lean protein. This all worked together with my training and by the end of 9 months I had lost the lion’s share of my post pregnancy weight. I lost a further 13kgs – a total of 21 kilos. The saying goes, “9 months on, 9 months off” which basically means, if it took you nine months to gain the weight, you need to give yourself at least 9 months to lose it (some experts say even up to year even). But you know what, much like your pregnancy journey, no two post pregnancy weight loss stories are alike. A few days ago, I posted a phrase on Instagram which summed up this journey perfectly, “Don’t expect perfection, Embrace the process.” This is exactly what you need to do, being a mom, wife and having full time job (I consider a stay-at-home-mom, a full time job too!) and trying to fit in training etc is super duper hard. It takes massive commitment. Don’t torture yourself looking at anyone’s post pregnancy weight loss pictures and comparing yourself (Please don’t compare yourself to me either) – You have GOT to focus on your progress, your body and listen to it and where it is at. I started slow, making small changes and then slowly made more. I have a mere 3 kilos to go to get to where I was before on the scale, however, judging on my clothes, I am basically back to where I was before, because all my old clothes fit me again, even my size 26 waist jeans. I do have to realise that this time, I do have more muscle than what I did before when I lost my weight, which weighs more than fat. So the scale might show a higher number even though I am fitting into my old clothes again. My body is not where I would ideally want it to be, but you know what? – I am strong, fit, healthy and feeling great about myself and my goodness, I made a whole other person! So did you! That is awesome! Give your body time to heal and adjust. Let online post pregnancy stories inspire you, the minute it starts making you feel bad about yourself – unfollow the person/account (I did this! ), you don’t need negativity in your head space while trying to change your body. I am sharing these pictures and my story, not to brag but to show you that if I could do, then you most certainly can too! I am not a fitness model, a personal trainer or genetically gifted – I was just consistent, patient and worked hard. Remember to celebrate the small wins, 500g weight loss or even 200g is still a loss and you should be proud of it! Just don’t go eat cake to celebrate if you know what I mean!